I’ve never read a Miranda Kenneally book before, but based on this book, she’s not too bad a writer. Almost as soon as I started reading this book, I was reminded of Jennifer Echols. More specifically, I was reminded of ‘Love Story’ by her. There’s the rich, hot dude, the poor, pretty girl, and the romance that can never be. If you’ve read the book, you probably know what I’m talking about. Personally, I liked ‘Love Story’ better. Maybe it’s because that book seemed just slightly more realistic, or maybe because I liked Mr. Snob aka Hunter better, but I would definitely recommend that over this when choosing between the two. Minus any comparisons though, this book is perfect for a day you just want to relax and unwind. 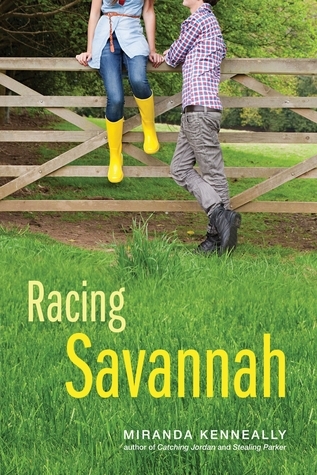 Reading ‘Racing Savannah’ takes almost no thought, and it’s an good way to unwind after a long day. It was interesting to read about Savannah; she’s poor and her father is in tons of debt, but she doesn’t hate anyone for it. She’s a very down-to-earth character, and it’s obvious she deserves the great life with Jack she craves. Savannah is very altruistic (though at one point, her dad says otherwise), and she is the greatest female jockey I’ve ever met (you know, ’cause she’s the only one I’ve ever met). And even though she doens’t like the fact that her dad got Cindy knocked up even though he didn’t marry her and doesn’t have enough money to support another child, she’s still civil to everyone and she still attempts to earn enough money to make life for her new sibling better than Savannah’s own was. Sure, in her thoughts Savannah refers to Cindy as She Who Must Not Be Named, but is that really that important? Of course not. Now Jack, he’s a whole ‘nother story. And, at least for me, he wasn’t love at first sight. Well, actually, I did fall in love with him at first sight, but the more I got to know about him, the more I lost that love, until he was just a friend. Yes, he eventually proved himself, but I like men who are strong from the beginning, or at least strong from when I first get to know them;) Savannah gives up almost everything for him, and though he admits that he likes her, he wants her to be his dirty, little secret. He gets POed when Savannah tells her family she wants to be with him, and from that moment on, he was unforgivable. I usually embrace the rich guys who don’t want their wealth, but want to strike up their own living; I like the guys who fight for what they want right from the beginning, guys who stand up to people who are walls between what they want. Guys like Jack? I either befriend them, or ignore them. P.S. Is anyone else reminded of that one movie? What’s it called? Oh yeah, ‘Barbie and Her Sisters in a Pony Tale’? I only watched the last five minutes of that movie, but I was constantly reminded of it when reading ‘Racing Savannah’…and I’ll go away now.